Home app design What is UI/UX Design and Why App Development is Not Just Coding? What is UI/UX Design and Why App Development is Not Just Coding? One question our Singapore team is often faced with when we work on creating an app is that, why do you need other people beyond the developers? Isn’t app development just about writing codes? Today, through this blog, I would try to explain how it’s not and talk about all that goes into developing an app most importantly, its UI/UX design. Often used together and highly integral to each other, UI and UX are two different things which make up a large part of an IT product development. Whereas UI design refers to User Interface Design, UX Design stands for User Experience Design. What is UI and Its Design? User Interface design involves working with the developers to create how the user interacts with the app. In layman terms, UI design refers to how does the app perform visually and what does it make the user feel. What should be the color scheme, where should the icons go, and all such cosmetic questions are what UI entails. A UI Designer will broadly work on the presentation of the app- the images, logos, icons, and links. Using the constraints set by the UX designer as guidelines, UI designers decide on the look and feel of the app. What is UX and its Design? User Experience Design is a broader field. It involves developing, designing and structuring the user’s needs from the product (here, app). A UX designer has to visualize how the app is going to cater to the needs of the user, typically answering questions like what will this button do? Will a tap on the logo lead somewhere? How many taps/clicks are getting a task done? How can that be minimized? Here’s the flow to give you a clearer idea. If someone is building, let’s say, a delivery app for Singapore. The role of the UX designers will involve researching on the app by studying competitor apps, user analysis- the problems and needs. It will enable them to decide on critical features the app must have, for example, in this case, a GPS-based location system. They will then work on the wireframes of the app. The created wireframes will be tested and redesigned accordingly, producing a prototype of the app. As the Android or iOS developers work on the app, the UI designers’ role comes into play. They are required to work upon the appearance, display, images, buttons, etc. of the app. 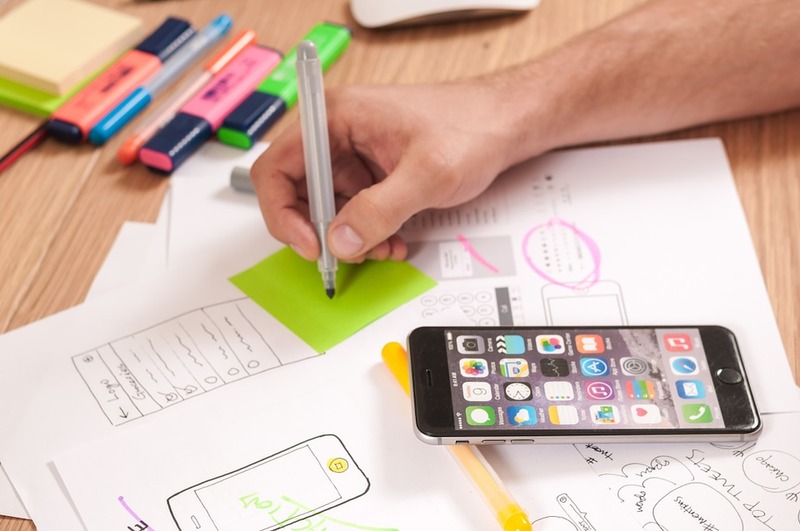 Thus, it can be concluded that while the UX designer will be involved in the making of the app early on, the UI designer’s task is more towards the later stages of the app development process. They both go together and are necessarily incomplete without the other. UX focuses on making the app offer ease of use, UI instead relates to domains that are directly interacted with by the user. Making a successful app that is loved by the user cannot be possible without a great UI and UX design. The developers may write the best code ever, but if the app fails to answer the user’s needs and does not impress with its interface, it will never be able to leave a mark. The code communicates with the computer, but UI/UX are elements that interact with humans. Since the app has to be used by humans, coding is a part of app development and a major one at that, but it is not app development itself. Quite straightforwardly put, humans who might not be as ‘techy’, will only judge the app by how it works and how it looks. Thus, the broad arena of app development is a lot more than about writing code. One of the most important aspects of app development is the UI/UX design. An app that appears tremendous but is difficult to use has a good UI and a poor UX whereas an app that performs well but has poor visuals has a good UX and a bad UI. An app needs to be both, and hence, UI/UX cannot be ignored at any cost. Previous articleI Have An Idea For an App But No Coding Skills. What To Do? Next articleWhat Are Enterprise Apps and Why Your Business Needs One? Why Flutter Will Not Replace React Native Any Sooner? Why Fintech is the Buzzword in Singapore?